Looking for the perfect place to stay on your city-break? 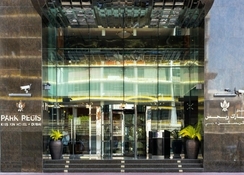 Then look no further than the Park Regis Kris Kin Hotel. 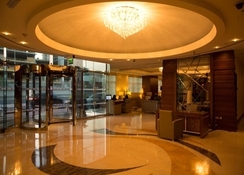 Travellers celebrate this hotel for its contemporary facilities, and its proximity to all the major tourist attractions. It provides half-board, bed & breakfast and room-only boarding options. The hotel features a rooftop pool offering spectacular views of the Dubai city, moreover, it is a perfect place to enjoy the soothing view of Dubai’s sunset, while sipping on delicious cocktails. Guests can satisfy their appetite in the hotel’s restaurants and have refreshing alcoholic and non-alcoholic beverages in the two bars. Other features of this hotel include – designer bathrooms, ergonomic workstations, international beers at the Grandstand Bar, a restaurant on the 19th floor with panoramic views of the city, and much more. 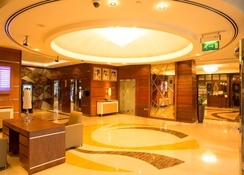 Centrally located in the historic centre of Dubai, Park Regis Kris Kin Hotel Dubai is a five-star hotel that houses 390 guestrooms perched across 19 floors. Places such as Burjuman Centre (900 metres), Zabeel Park (3km), Dubai Museum (3.5km), Dubai World Trade Centre (4km), Burj Khalifa (8.6km), Dubai Dolphinarium (4km), Wild Wadi Water Park (22km) are within minutes from the hotel. And in case you want to go shopping around the city, Bur Juman Shopping (900 metres), WaFi Mall (4.5km), Deira City Centre Shopping Mall (5.5km), Dubai Mall (8.7km), New Gold Souk (2.7km) and Meena Bazar (20km) are some popular destinations. The famous Jumeirah Beach is 14km away, while the Dubai International Airport is only 10km away from the hotel. Park Regis Kris Kin Hotel houses 10 categories of rooms, broadly categorised as Superior Rooms, Deluxe Rooms and Burj Executive Suites. The accommodations are rich in décor and chic in design, each furnished with French windows that offers beautiful views of the surroundings. Facilities and amenities may differ from one room to the other according to the categories. But some common features you can anticipate are TV with satellite, air conditioning, Wi-Fi internet, work desk, couch & table, electric kettle, mini bar, en-suite with complete bath amenities, hairdryer, safe deposit and iron & ironing board. The gastronomic experience in the hotel is simply kingly and plentiful. The Kris located on the 19th floor is a resto-bar that opens from 6pm to 2am. It specialises in Asian cuisine, served with complimentary premium wine. For buffet meals, the La Metro is the main restaurant that presents breakfast, lunch and dinner between 5:30am and 11:30pm—it also serves a la carte menu for dinner. Marhaba is a lounge located next to the main lobby that serves snacks and hot beverages between 8am and 11pm. And finally, for some premium liquors, beers and signature cocktails and mocktails, head to the G-Grandstand Bar— open between 12pm and 3am. There are plentiful sports, entertainment and leisure facilities available in the hotel. There is a roof-top swimming pool, which is a perfect place to enjoy the Dubai weather and the breath-taking views of the Dubai skyline. 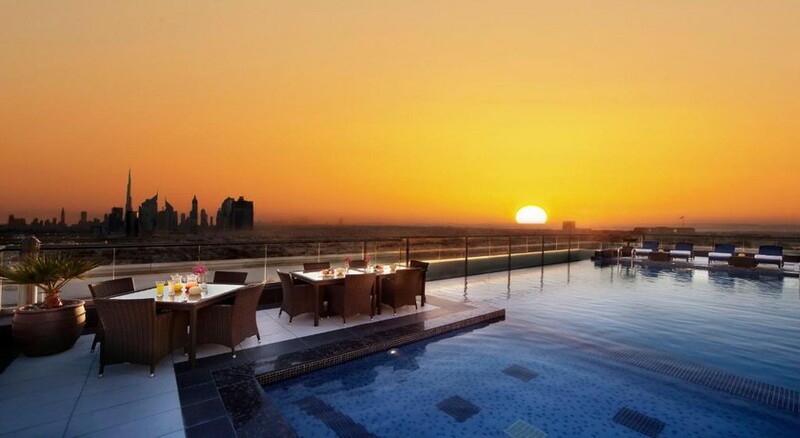 Whilst glazing the unforgettable sunset, you can enjoy refreshing drinks on the roof-top swimming pool. If you want to relax and get relief from pain head to the Jacuzzi with hot water and hydro therapy. Guests can maintain their fitness level in the fully-equipped gymnasium.